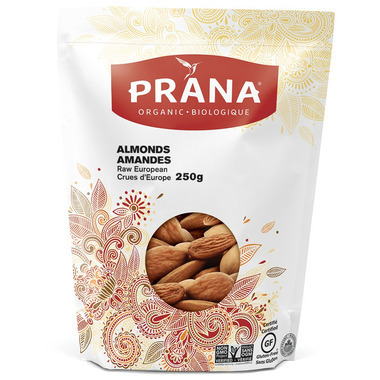 These organic raw almonds make for a nutritious snack and a delicious versatile ingredient. Loaded with antioxidants, raw almonds contain healthy fats, fiber, protein, magnesium and vitamin E. The health benefits of almonds are well document and include lower blood sugar levels, reduced blood pressure and lower cholesterol levels. These nutrient-dense nuts make for the perfect snack to crush hunger on the go. Almonds are a key ingredient for various recipes. Raw organic almonds make the best homemade nut milk, yogurt, cake bases, cookies, energy balls and so much more! You can substitute cow’s milk in most recipes with homemade raw almond milk. Note: European almonds have a light naturally sweet taste, but they can sometimes be bitter, due to their country of origin and the way they are grown. Ingredients: Organic raw European almonds. May contain nut shells, traces of nuts, soy and sesame ingredients.